This could quite possibly be the most epic dressgasm I’ll ever post. 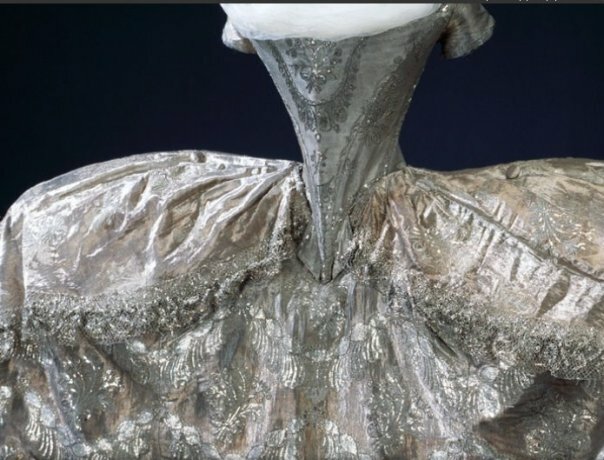 This sculpture of a gown, more of a work of art rather than a dress, was the wedding dress of Edwige Elisabeth Charlotte de Holstein-Gottorp. 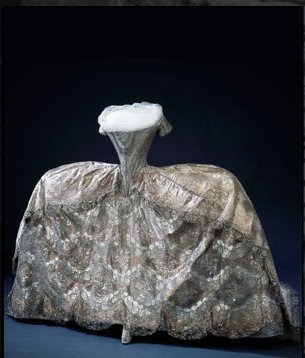 She was French, as I recall (please correct me), and this wedding gown was made for her to marry Prince Karl of Sweden in 1774. Upon her marriage, she became the sister-in-law of King Gustave III of Sweden. This was happening at the same time of Marie Antoinette’s rise to power in France and she later gave a painting of herself and her children to King Gustave. Additionally, it has been hotly debated as to whether Marie Antoinette had an affair with a Swede who was a confidante of his own king, as I recall. These royal families were all intertwined and related to one another throughout Europe. Gowns of the European court were massive in the eighteenth century and not at all representative of what the regular population wore. Fabrics of the super-rich were threaded with real silver and gold, accented with intricate laces, embroidery and many gowns had actual jewels sewn into them. It was a very romantic and naive period of history in which women were beautiful pieces of adornment like a fabulous piece of furniture or a delicious ostentatious cake. As economy, philosophy, education and social debates arose in Europe and the Colonies, the romance faded somewhat and the size and scope of these gowns faded with it. 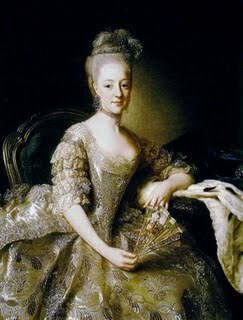 And here is a painting of Edwige Elisabeth Charlotte de Holstein-Gottorp wearing the above wedding dress. >Can you even imagine trying to go pee in that? Better learn how to pee standing up, girl! LOL! >That dress is so beautiful, it makes me want to cry. >Ooooh!! Wow! That is stunning! I wonder how they fit through doorways, you would have to turn sideways I guess. It is gorgeous though! >Yes, it is an amazing Gown. I happen to have a cross between a Crinoline and a Pannier Gown, but nowhere near as Huge as this one. Opulence of the highest order was certainly "de rigeur" then! I quite like it, however impractical it may be.